Summer is not one of my favorite seasons in Korea. In addition to the smothering humidity, an unimaginable amount of bugs start popping out of the woodwork. Next to the vicious mosquitoes, cicadas are one of the most problematic insects of the season. My first summer in Korea was spent wondering why it was so incredibly noisy outside. I could hear a loud rattling/clicking/alarm sound that comes and goes in waves. 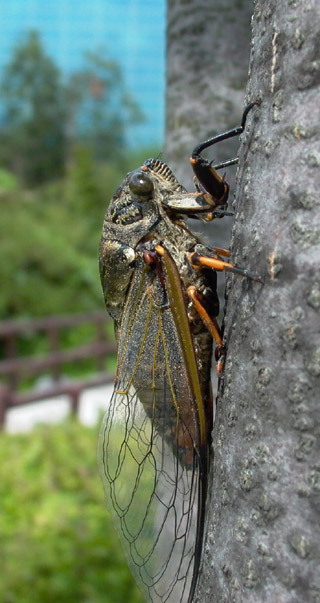 It wasn’t until my roommate told me, that I realized it was the sound coming out of this huge winged bug slapped to the side of a tree, a cicada or 매미 (maemi) in Korean. Being unfamiliar with the noisy lil’ suckers I did a bit of research on them. So if you’re from a cicada-free hometown like me, here’s what you need to know. 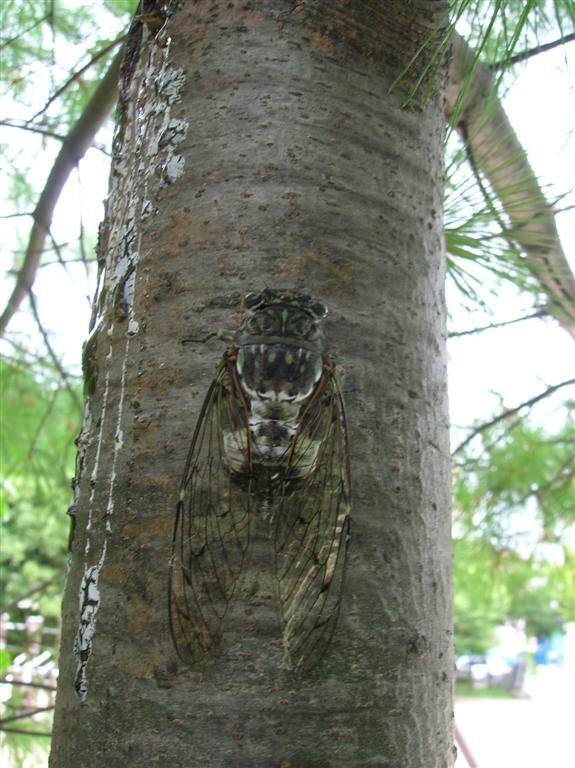 Due to many factors, the cicadas in Korea continue to grow in both number and species every year. Global warming and climate change have allowed larva to survive the winter. 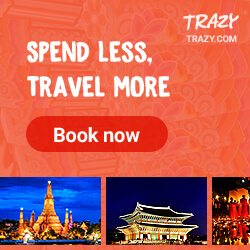 In addition, various species migrate from China and find a permanent attachment here. These bugs are generally very large and come in natural green, brown and black colors. While adult cicadas are equipped with large veined wings, juveniles are not. They can, however, jump hundreds of times their body length making you want to keep your distance. As for their headache inducing chirping, it is an unfortunate sound of love. Cicadas chirp to find their mates, but because of the loud noise in the city they have to amplify their chirps to send their signals. Generally, their chirps tend to be 75 decibels louder than the 70 decibel ring of a cell phone, so you can only imagine the sound of a bunch of them going off at the same time. Excessive nighttime lighting in Seoul also encourages their chatter after the sun goes down. Lucky for me I have double pane windows, but unfortunately a lot of other people don’t so complaints usually fill the ears of city officials from very annoyed citizens this time of year. Children, on the other hand, take this seasonal opportunity to go bug hunting. You can find overly excited kids running through apartment complexes or parks with butterfly nets and plastic cages in hand. Quite frankly, the more they catch the fewer I have to listen to. 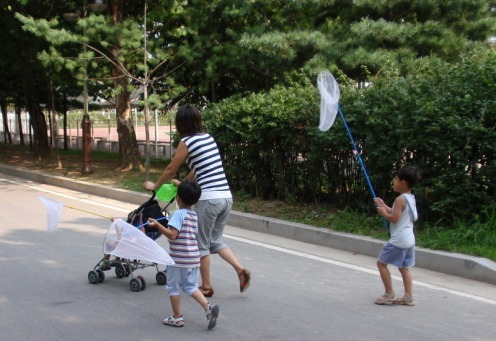 So, for all you bug lovers, join the cause and catch a bug or two Korea will thank you for it. Shhh! Be vewy vewy quiet, I'm hunting cicadas. ***UPDATE: I stand corrected. Apparently my double pane windows are no match for an insect in heat, as I discovered at 6am this morning. May the winter come swiftly…or at least a lot of hungry birds. Tags: Bug Sounds in Korea, Bugs in Korea, Cicada, Korean Cicadas, Noises in Korea, Seoul, Summer in Korea, Summer Korean Bugs. Bookmark the permalink.